Interested? Email me at contact [at] amandaliew.com to see which spots are still remaining! How do I sign up for a photography session? Contact me first so we can hash out the details & time slot. If there is one that is available, I will ask that you send me your donation receipt or Venmo me if you’d prefer I do it. Can I donate more than the minimum? YES PLEASE. That is the hope & goal! What’s included in 20 minutes? Can I do more than 20 minutes? Yes! 40 minutes = minimum $100 donation, 60 minutes = minimum $150 donation. Can I do a family session / friend session / couples session? Absolutely! If you have a large family, though, I would recommend doing a one hour session to ensure we have enough time. How many sessions are available? A total of nine 20 minute sessions are available during the 3 our time block (1-4pm): 1:00, 1:20, 1:40, 2:00, 2:20, 2:40, 3:00, 3:20, 3:40. Some people may opt to take more than 20 minutes though. 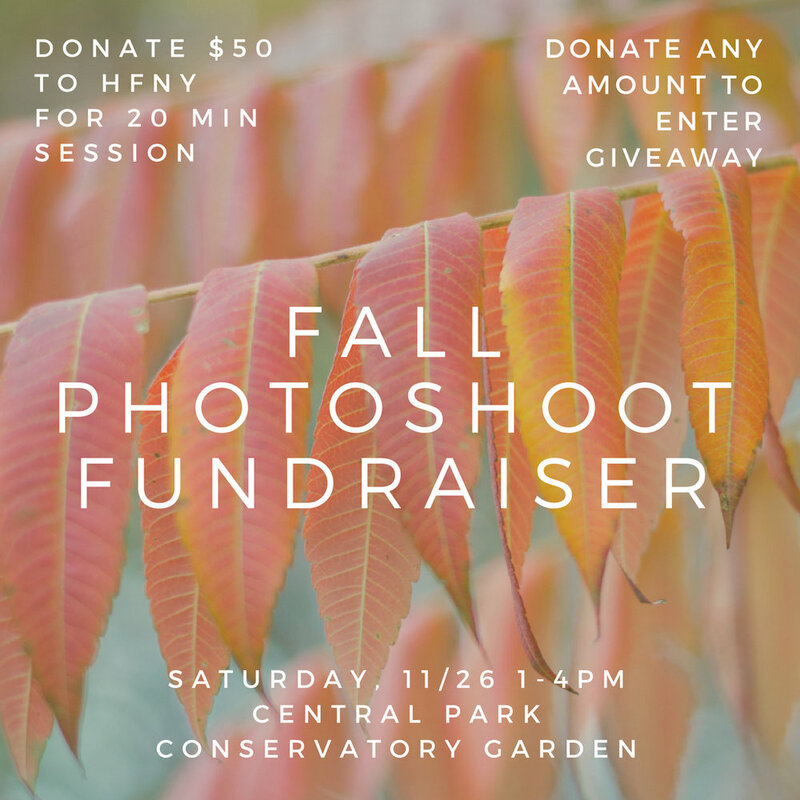 Go ahead and donate at hfny.org/donate and send me the receipt with a note that you'd like to enter the raffle? The winner will be picked at random on Thanksgiving at 11:59pm EST. How much should I donate to enter the raffle? Whatever is pressing on your heart! I encourage you to give generously. Can I enter the raffle for someone else? Sure thing! That's so nice of you. Why Hope for New York? Why the Central Park Conservatory Garden? Because there are less tourists & the fall foliage near there is beautiful! I love photography, but I don't want to be a professional photographer. I often struggle with finding the right balance between using my skills to serve other people but also not devaluing my time & effort by doing things for free. This is my solution for now! Are you taking a cut of this? Nope. 100% is going to Hope for New York and I'm donating my time to making this happen.